Why should I consider hardwood floors? When should I consider new floors? What is the relationship between my floors and my home decorating? What is the difference in grades of wood? What is the warranty on my new floors? Is solid hardwood the best in all cases? Is ¾" hardwood the best in all cases? Does sanding and finishing a floor take off a lot of wood? Do hardwood floors need wax to restore the sheen when they become dull? What is the appropriate time period for allowing the wood to acclimate to the house? Does the subfloor have to be perfectly level to install a hardwood floor? Are engineered floors cheaper, less durable and impossible to re-surface? Hardwood Floors are easy to clean, more sanitary than carpet, offer an almost infinite array of styles, and outlast all other flooring types. You should consider new hardwood floors from the time you start thinking about decorating your existing or new house. The species, color, and floor design will influence many of your decorating choices including trim, cabinetry, and wall coverings. Click here to view an informative "grade chart" for various woods. The minimum warranty on a Rock Solid Floor is one year on job site finished floors and up to 25 years on select pre-finished floors. Always use a product that will not leave a wax or oil residue on your floor, as these may cause a problem when you need to refinish your floor. Judiciously utilize door mats and area rugs to reduce the impact of high-traffic areas and outside dirt being tracked in. Also, be conscious of scratching from various sources such as high heels, moving furniture, etc. We recommend the BONA KEMI line of Floor Care Products, which complement the BONA KEMI floor finishes used by Rock Solid. Click for an important tip regarding "those heels!" Because hardwood floors are sensitive to climate, seasonal cracking is common. Humidity causes expansion and dryness brings contraction. To minimize cracking, a humidifier can be used to balance out Colorado's environment by maintaining a constant humidity level between 30% and 50%. No. Engineered floors are actually more dimensionally stable in that they move less than solid wood floors, can be used in a wider variety of applications, and are less subject to moisture variations. No. ¾" hardwood has less than ¼" of actual surface that can be used before re-surfacing. ¾" also moves more than lesser thickness' due to a bigger sponge effect. Traditionally, wood floors were made of ¾" thickness because they were a structural element over a floor joists. The sanding and finishing process, including all coarseness' of sandpaper, only reduces the thickness by 1/64". 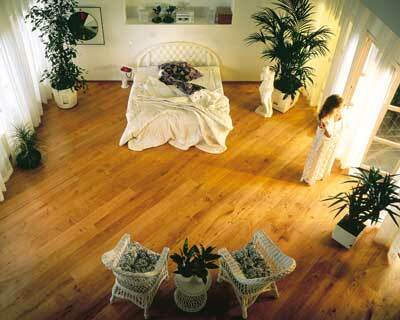 Most hardwood floors are now finished with urethane and require no wax. In fact, wax will actually harm the floor by preventing re-coating. Site-Finished floors shrink and actually allow water between the boards which can cause permanent damage if not mopped up immediately. Most all hardwood flooring is milled between 6% & 9% moisture content and requires only 3-4 days in the area to be installed for temperature and moisture acclimation. The critical element is completion of all wet surfacing and 48 hours of normal temperature settings preceding installation. Click for "Parameters That Apply to Contractors!" No. The subfloor does not have to be level, but must be flat for a proper installation. In some case, even an uneven subfloor can be corrected. Another myth. Engineered floors at Rock Solid are actually made better than their solid floor counterparts. They will shrink 75-90% less and, depending on the manufacturer, have better warranties. Also, re-surfacing can be performed just like solid wood floors. copyright © 2000 - 2008 Rock Solid Hardwoods, Inc.